In this political-thriller type mystery, Fandorin is trying to clear his name from an attempted-murder charge by catching the real culprit. One of the better mysteries in the series, it is also notable for Oleg Menshikov movie performance as Fandorin. One cannot imagine the character to look any other way.What to ExpectEach novel is written as a different type of mystery. Akunin set out to rectify the low-brow reputation of the mystery genre in post-USSR Russia by writing worthy literature and exploring the wide gamut of sub-genres. Each novel is therefore excellently written as a different type of detective case. While there is continuity in the protagonist's life between the novels, each is very different in themes and tones.I've written a condensed review of the whole series on my website.What I likedI like the writing style. The prose is intelligent and flowing, the mysteries are complex, and the cast is varied (though those that make repeat appearances tend to die). Fandorin himself is a great character, even though as a main character he still remains an enigma - a tantalising mystery in itself that keeps readers engaged and clamouring to know more.I love the historical background. Akunin has done his research into Russian culture, mannerisms, environment, personalities, etc. of the late 19th century / early 20th century. Most of the stories take place around Moscow, and Fandorin gets to meet and associate with the people of the times (from the low-life criminals of Khitrovka, to the grand-dukes of the imperial family). In a few cases, Akunin also has Fandorin active around notable events of the era, at times filling in details where history has left us stumped.Akunin is also a Japanophile, and has Fandorin spend a few years in Japan. While details are sketchy (and we want more! More! ), it is clear that he has a great love and deep knowledge of that culture and times.What to be aware ofBe aware that each of the novel is told in a different style. Besides the obvious (something new and different in each volume), one keyword is 'told'. They are almost all in 3rd person perspective, and quite often not from the point of view of Erast Fandorin (which is both tantalising and frustrating at times). It's this distance that keeps Fandorin an enigma, and keeps us coming back to learn more.Fandorin has a Sherlockian intellect and impressive physical prowess. He is not without his faults (most notably hubris), but as a hero he is certainly a cut above the rest. He also tends to get involved with a different femme fatale in each book. This suits the detective genre perfectly, regardless of modern sensibilities.While the books are not really related and have few continuing characters, I'd still strongly recommend to read them in order.Lastly, and this has nothing to do with Fandorin, since these are professional translations (amazingly done by Andrew Bromfield) via a traditional publisher, the price of ebooks and hardcovers is almost the same. The ebooks are also missing some of the illustrations and other typographical effects that are present in the print. I'd definitely recommend reading the print edition, where possible.SummaryShould you read these novels? Yes! By all means, if you love historical mysteries these novels are a must read. It is an intelligent, engaging, and just different enough series to be in a class of its own. It's not surprising that in his home country of Russia, Akunin out-sells JK Rowling. In fact, since it's been a few years since I've read them, I think I'll go back and re-read my favourites (Winter Queen, State Counsellor, and The Coronation).--Assaph Mehr, author of Murder In Absentia: A story of Togas, Daggers, and Magic - for lovers of Ancient Rome, Murder Mysteries, and Urban Fantasy. YES 5 Stars - You are reading correctly, is is NOT sunstroke.....Another Arch-nemesis for Erast Fandorin to deal with in a very Sherlock Holmes style of read set across Moscow C1860's or thereabouts. Revolutionaries, pseudo-intelligentsia(i), ideologist students of rich families, orshika (secret police) & double agents throughout for Erast to battle & form alliances with as the case(s) unfold.The villian (Muuuuuulhahahahahahahah) is as engaging as our hero & for me receives equal star billing. plenny of near scrapes as usual with "The flight of the Hawk" being an alltime favourite from now on & mystery to keep yous entertained.A very good read for a historical fiction, mystery or crime reader & if you like all three like me, bonus! If you've not tried Boris Akunin before then yer missing out on summit I say! Go'on you know you want to?? I happily turned to Erast Fandorin after too long an absence. I discovered him when I lived in Kent and loved him. An unusual detective in Czarist (Tsarist?) Russia, he has a stutter, a Japanese manservant, and is forever unlucky in love.In this entry, he has to deal not just with the always dangerous politics of the government service in Moscow, but also a band of dangerous revolutionaries (terrorists). Erast is very like Sherlock in his deductions, but a much more sympathetic character in that he is not perfect. Unfortunately, these mysteries are not available on Kindle, so I have a hard time finding them. Oh, well, that's why they have interlibrary loans, right? The sixth in the series, I think that this is (thus far) his best: reactionary autocrats, revolutionary terrorists, murky plots, sinister schemes and a heavy political edge I really enjoyed this bleak tale!I particularly enjoyed the vivid painting of the key revolutionary 'Green'. Fashioned by a cruel world, Akunin has done a great job in constructing a beautiful example of the sympathetic villain. This book has it all, assassinations, bomb-making, bank heists, love trysts, and scores of bodies piling up as the stakes are raised every page. I loved it. I would even give it 2 and half stars - this is the worst one in the Fandorin series so far. E' inutile che cominci questo commento facendo mille giri di parole, possono aspettare, perciò andrò subito al sodo: Il consigliere di stato è, insieme a Incoronazione uno dei migliori romanzi della serie dedicata alle avventure di Fandorin. Seguono, a breve distanza, La regina d'inverno (Azazel'), La morte di Achille e Il marchio del fuoco. Gli altri arrancano o semplicemente non riescono a competere. E ora, per spiegare perché tengo Il consigliere di stato sul gradino più alto, occorre addentrarsi nei dettagli. Spoilers ahead ovviamente. La storia si svolge nei primi gelidi mesi del 1891, con l'omicidio di un generale malvisto dai rivoluzionari e della cui morte Fandorin viene brevemente e ingiustamente accusato. Quanto basta, insomma, per coinvolgere il nostro eroe nelle indagini e portarlo sulle orme del gruppo di terroristi rivoluzionari guidati dall'enigmatico e pericoloso Green.L'apertura del romanzo, con Green che si traveste da Fandorin per potersi avvicinare a Chrapov e compiere la missione, anticipa, in un certo senso, il modo in cui si struttura: la narrazione, infatti, segue sia Fandorin che Green a capitoli alterni e offre al lettore la possibilità di seguire la storia dal punto di vista di entrambi, scelta che permette di non perdersi nessun dettaglio e di poter entrare meglio nelle vicende. Protagonista e antagonista corrono su due binari diversi ma paralleli, si "incontrano" per caso ed entrambi sono sulle tracce della stessa persona, che per Fandorin è il traditore che sabota il lavoro delle forze dell'ordine e per Green l'informatore che permette al suo gruppo di lasciare indisturbato la sua scia di terrore. Green, probabilmente, è anche una delle nemesi più intriganti e meglio riuscite ad Akunin, così come Needle è uno dei suoi pochissimi personaggi femminili che non mettono alla prova i miei nervi. Chi ha dato uno sguardo agli altri commenti che ho lasciato ai libri di questa saga saprà sicuramente che ho qualche problema con le donne che la popolano e che le ritengo essere il punto debole di Akunin. Molte sono esageratamente teatrali o esagitate, altre, con la scusa del doverle rendere "originali", finiscono col risultarmi fastidiose (e altre ancora sembrano piazzate lì perché non sia mai che manchi il love interest di turno per Fandorin eh), ma con Needle - incredibile ma vero - ha compiuto il miracolo che non mi sarei mai aspettata. La sua backstory è solo accennata nel corso della storia, ma riesce comunque a dire molto sul personaggio, non ci dirà cosa l'ha fatta avvicinare di preciso alla causa rivoluzionaria, ma ci spiega perché ha un carattere spigoloso e ci fa capire che sotto, alla fin fine, c'è sempre un essere umano con un cuore ancora in grado di amare.Il nostro Fandorin, invece, viene a trovarsi in una fase importante della sua carriera e della sua vita. Siamo in un momento di transizione, col vecchio principe Dolgorukoj, suo protettore, che sta per giungere al termine della sua carriera, ma anche con una Russia che sta per entrare in una nuova e turbolenta fase storica. Siamo anche davanti a un Fandorin trentacinquenne che ha raggiunto il grado di consigliere di stato e potrebbe arrivare più in alto, a capo della polizia, ma pur sempre davanti a un Fandorin coi suoi scrupoli morali e il suo amor proprio che nel corso del romanzo viene ripetutamente stuzzicato e ferito. L'arrivo dell'ambiguo Pozharskij, in certo senso, fa da forza scatenante: non sconvolge solo gli equilibri moscoviti, ma dà anche inizio a quel processo che porterà Fandorin a prendere la sua grande decisione finale lasciando attonito il granduca Simeon Aleksandrovich. Non si tratta solo di vanità e orgoglio feriti, dietro c'è anche qualcosa di più profondo che tocca la coscienza e ci fa chiedere se valga davvero la pena compromettersi e mettere in discussione i propri valori in nome della carriera e dell'effimero successo.Ovviamente, non mancano dei punti deboli, che sono poi il motivo per cui non posso dare cinque stelle belle piene a questo romanzo. Come accennavo sopra, Akunin non ce la fa coi personaggi femminili e neanche questa volta di risparmia il love interest temporaneo, che in questo caso prende il nome di Esfir. Esfir è quella che potremmo tranquillamente definire una bored rich kid: il padre è un banchiere impacchettato di soldi che, pur di sentirsi accettato in società, ha abbandonato la religione ebraica per quella ortodossa e lei, vuoi per noia vuoi perché deve trovarsi qualcosa di scandaloso da fare, si avvicina ai circoli rivoluzionari ripetendo a pappetta discorsi pre impostati, neanche fosse un pappagallino. Fa bene a sottolineare le ingiustizie di cui purtroppo la società è piena, ma l'avrei trovata più credibile se avesse almeno riconosciuto anche la sua ipocrisia, che in parte emerge grazie alla frittelle di Dolgorukoj. C'è da dire che, oltre a fare la figlia ribelle, Esfir, come anche il padre che indossa le decorazioni per salutare di sfuggita Fandorin, prova un certo gusto nell'apparire e far parlare di sé (alla soirée di Dolgorukoj ci va perché sa che sarà l'attrazione della serata e si divertirà a scandalizzare la società da bene, Fandorin le offre solo l'occasione per poterlo fare in tutta tranquillità). Eppure questa rilettura mi ha fatto spezzare una minuscola lancia in suo favore. Esfir è sempre stata un'outsider, l'antisemitismo dilagante l'ha costretta a tirar fuori il carattere e a farsi rispettare e questo suo essere in bilico potrebbe averla spinta a cercare risposte nelle nuove idee (come lei, ricordo lo è anche Green) e nella giustizia sociale urlata a gran voce. Fin qui nulla di male, ma ad Akunin non interessa renderla un personaggio tridimensionale e ad approfondire la sua caratterizzazione perché tanto a fine romanzo saluti e baci, hasta nunca, e quello che viene fuori è una ragazzina viziata, esagitata e arrogante (c'è una bella differenza tra l'avere un carattere forte ed essere invadenti e pronti a scattare come una molla per un nulla). La sua relazione con Fandorin, poi, sembra buttata lì perché lui doveva in qualche modo toccare con mano i circoli rivoluzionari e avere una donna (Akunin, non è una regola eh, just sayin'). Non riesco neanche a giustificarmela come un'attrazione fisica, perché lui mi sembra buttarsi nella storia a mo' di "oh, me tocca pure 'sta volta, ma chissene" mentre lei, che ne so, avrà bisogno di qualcuno a cui urlare e di una casa altrui in cui piazzarsi senza invito pur di non vedere la sua.Insomma, pecche a parte, il romanzo è talmente ben scritto e strutturato che mi è impossibile farmi influenzare più di tanto dai difetti, per quanto irritanti siano, arrivata all'assegnazione di un giudizio in stelline. Akunin, quando vuole, sa essere un gran narratore e ci regala dei libri e un Fandorin in piena forma e Il consigliere di stato ne è la prova. Fandorin returns in an exciting new adventure! The State Counsellor sees him chasing after a band of communist terrorists following the assassination of a leading figure in the Tsarist hierarchy - for which the terrorists impersonate Fandorin himself.A rollicking good story, with a good number of plot twists, Imperial Court intrigues, and femme fatales, this is Akunin back to form in an engrossing new title.Reason for four stars, and not five? There are a few story devices that annoyed me as a reader a bit - an action takes place, and then the story rewinds to play the same thing through another person's viewpoint. While this is used to advance the story somewhat, and adds to some of the plot twists, I feel that perhaps some of these could have been executed in a slightly more expedient way.Secondly, there were a few anachronisms with the translation, such as the use of Flying Squad and turnpike, which bugged me. Both are cultural impositions from the UK and US respectively, and are out of place in the book. While the title of the Okhranka (Tsarist spy agency) is left untranslated, why were these translated so clumsily? For turnpike at least, perhaps tollbooth would be a better word - and one that is more universal in English?Those are two small points really, but overall a thoroughly enjoyable read. Well worth a go. I wish they'd translate more of Akunin's work. I'm spinning these out for as long as I can - and given my desire to devour them in one marathon session it's hard - but I'm going to run out before long and there won't be anything to take their place. I can't think of another writer who can spend half a book in the mind of the adversary (I use that word loosely given the devilish complexities of the Tsarist bureaucracy and the uncertainties of who the real adversary is) and leave you feeling that you don't care if you ever get back to the protagonist no matter how delightful he is (and he is). The usually twisty world of Erast Fandorin becomes impenetrable an mystery (adventure? intrigue? ) that I think assumes more than an average non-Russian's understanding of Russian history, especially the role of insurgents in the 1890s. I, for one, got super lost and gave up trying to place who was where and why about 2/3 of the way through. Not a recommend here, even though it's been a long while between English language Fandorin novels.I received an ecopy from the publishers and NetGalley in exchange for an honest review. בניגוד לספרים הקודמים בסידרה, הפעם פנדורין מובל לאורך החקירה ולא מוביל איתה. פנדורין מנסה לחשוף תא טרוריסטי של מהפכנים שביצע רצח פוליטי, אבל מהר מאוד הוא הופך לסטטיסט בחקירה, כשהוא צופה מהצד במאמצי 3 בכירים שונים לחשוף את חברי התא. העובדה שדמותו של פנדורין די דהויה לאורך הספר, הופכת אותו לפחות מוצלח בעיני. С этой книги началась моя любовь к Фандорину. Отличный роман, изящный слог, обаятельный главный герой. The best one in the series!!! The novel is much better than the Russian TV movie. На мой взгляд, это вторая наиболее цепляющая вещь в цикле. Первая - «Азазель» если что, но я о ней уже писал. Если можно так сказать, «Статский советник» - это такой темный брат близнец первой книги. Та, была довольно светлой в своей идее, лёгкой и в чем-то даже романтичной. А герой книги, как я уже говорил не был ещё отмечен печатью МартиСьюшности, верил во все светлое и горел желанием помочь государственной машине. При всей неоднозначности концовки (вспомните побирающихся детей, например) было понятно где здесь добро, а где зло.В этой же книге все не так. Здесь даже не один сверхчеловек, а как минимум два. Второй - революционер, положивший всю свою жизнь на то, чтобы стать достойным своей пламенной идеи – перевернуть мир. Тот ещё супермен - сильный, немногословный, волевой, разбирается в людях. Короче - тот самый из кого надо делать гвозди. Достойная альтернатива герою. И в то же время, не с ним происходит главная схватка у Фандорина. Тут, как и во всех книгах цикла происходит сражение между Хаосом и Порядком. Точнее не так. Сражение с кем-то, кто хочет стравить хаос и порядок, чтобы загрести оставшиеся трофеи. Или даже… в общем, тут много всяких конфликтов, что тоже идет в плюс книге и заставляет вспомнить начало пути Фандорина. Что еще объединяет эти книги – сила воздействия на героя всех происходящих событий. И я имею в виду эмоциональное воздействие. Как в первой части из счастливого и обласканного фортуной молодого человека он превращается в такую морозную статую, так и тут, он переосмысливает свои моральные принципы. Из идеалистичного человека, который хочет служить государству, он осмысливает происходящее вокруг него и собственные принципы. И да, это тоже большой шаг. Ожидаемый, банальный, но при этом большой. Самый большой шаг во всем цикле, пожалуй. А, вдобавок еще хочу выделить язык книги. Он действительно хорош. Особенно по сравнению с окружающими его романами. По объему книга больше чем предыдущий и последующий, но вот прочитал я его быстрее. Может быть конечно ещё и потому, что в нем довольно хорошо поставлена динамика повествования. Рассуждения о судьбах России. Ограбление двух повозок с деньгами. Рассказы о методах работы жандармов. Захват революционной ячейки. Поиски «крота». Все это хорошо чередуется и не успевает надоесть своим однообразием. Ну и да, конечно, детективная составляющая, она здесь тоже подаётся уместно. Несколько сюжетных ниточек, куча подозреваемых, каждый ведёт свое расследование и преследует вроде как одну цель. Точнее, то, как он сам лично эту цель видит. Есть где поразмыслить кто здесь, кто, и чего этот «кто» хочет добиться. Чередование глав за условно «плохиша» и за условно «хороших парней» тоже получилось интересным. Условно – потому, что автор не очень делит эти лагеря по уровню положительности. По ощущениям, он симпатизирует обеим группировкам. Он уважает цели, как государства, так и революционеров. Единственное, что немного омрачило на мой взгляд повествование - довольно много действующих лиц с обеих сторон. И не все они оправдывают свое существование. Могут довольно часто упоминаться в диалогах, но затем мелькнуть в одной из сцен и пропасть. Вообще на самом деле ярких персонажей тут два. А теперь сюрприз - Фандорина в их числе нет. При всей своей важности для цикла, он тут скорее, как двигатель сюжета, а не яркий символ чего-то важного. Основные действующие лица в этой книге - это Грин и Пожарский. Вот кто тут олицетворяет философские идеи. А Фандорин – он такой критик и наблюдатель (а, и двигатель сюжета, конечно же). Но книга получилась очень хорошей. Напряженной и остросюжетной, увлекает не на шутку и при этом умудряется показать эволюцию заглавного персонажа и одно из ключевых событий в его жизни. А еще – задает еще один неплохой импульс интереса ко всему циклу. When most people think of Russian literature, they don’t think of anything contemporary. Tolstoy, Dostoyevsky, Nabokov, Pasternak – these are the names that spring to mind, and yet none of these authors lived past the 1900’s. A great deal of this has to do with politics; political themes pervade Russian literature as much as it does Russian life. As political and social ideologies fall in and out of favor with Western sensibilities, so does literature influenced by these movements. Modern Russian writers are no less talented, just less fashionable. Considering the current state of affairs between Russia and America, it seems unlikely, then, that the U.S. release of Boris’ Akunin’s novel, The State Counsellor, will attain much publicity in the States – which is a shame, as the book is well worth the read.In The State Counsellor, fans of Tolstoy or Dostoyevsky will find themselves in familiar territory – revolutionary Russia in the 1800’s. The story is one of political intrigue told from two perspectives: the titular state counsellor, Erast Petrovich Fandorin, and the hardened, battle-worn revolutionary known by the alias ‘Green’. The assassination of a prominent political leader starts off a game of cat and mouse between government authorities, led by Fandorin, and Green’s Combat Group, a band of terrorists intent on overthrowing the tyrannical tsarist government. Treachery and shifting loyalties on both sides make you question who the good guys really are (or if there even are any), and keep you guessing the outcome until the final pages.For Western readers, the dense, complex political structures in The State Counsellor may be difficult to navigate. Also complicating matters is Russian tripartite naming conventions; the use of patronymics can make it challenging to differentiate between the large cast of characters within the story. At times, I found the portions of the story dealing with the revolutionary group more enjoyable simply because their single name aliases made it easier to understand the players involved. But the lead character, Fandorin, is an interesting character, and keeps you drawn in. While the British refer to Fandorin as a “Russian Sherlock Holmes”, for me he seemed more akin to Agatha Christie’s Hercule Poirot – a bit less priggish & morally high-handed, perhaps, but with the same precise, fastidious nature and attention to details others might overlook. It is no wonder that the novel, originally released in 2000 in Russia, has attained such popularity, and that Fandorin went on to be featured by Akunin in a series of books. Hopefully, it will not take another 17 years for the rest of the series to be released in the U.S. I look forward to reading more of Fandorin’s adventures. Ho già lasciato un commento a Il consigliere di stato dopo averlo riletto lo scorso anno, che trovate qui, perciò stavolta mi limito a delle brevi considerazioni su questa edizione italiana. Stento a crederci, ma ho trovato la traduzione inglese più in linea coi toni del romanzo rispetto a quella italiana, che ogni tanto risente di qualche piccola svista che mi ha portata spesso a chiedermi se la Frassinelli abbia fatto ricontrollare il testo a un revisore. Il libro rimane comunque uno dei migliori della serie e non smetterò mai di ringraziare l'anonimo lettore che ha deciso di separarsi dai suoi libri e lasciarli nel negozietto dell'usato di fiducia, risparmiandomi viaggi tra mille biblioteche e inutili ricerche su Amazon. Not liking "Special Assignments" much I expected the worst and to begin with I thought I was right. Green the terrorist didn't hold any interest for me and a large cast equipped with first names and patronymics as well as last names (and all Russian at that) made me mightily confused. But about a hundred pages in it all changed.A new "sheriff" comes in from Saint Petersburg and all of a sudden Fandorin is jolted into action for real. Being out staged by a man even more charismatic and possibly smarter than himself doesn't suit our hero one little bit! So... High time to pull his sleeves up. Metaphorically speaking of course. He would never willingly crease his fancy clothing. And the story turns tighter and more exciting. The pace heightens. The rivalry between the two crime fighting geniuses is fun to follow and their shaky cooperation kind of sweet and Erast new more-than-a-handful girlfriend sure is a feisty one. And what do you know?! For the rest of the book I was copiously entertained! By the twists and the turns. By the action. By the humour and the characters.4,5 big smiling stars to a Boris Akunin at his best. You really don't want to miss this! These are terrific books! The combination of Russian history and a mystery just can't be beat, especially with a character as entertaining as Fandorin. 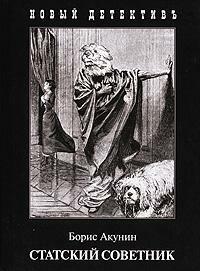 If you have not read Akunin before, try this one- you don't need to have read the earlier books to enjoy it. You'll discover a whole new really cool series, complete with lots of twists and turns. The fact that the author is a Georgian and grew up in the USSR no doubt adds to the atmospheric nature of the tale. This is well translated, Thanks to Netgalley for the ARC. I really enjoyed this and highly recommend for a solid, intelligent, and rip roaring read. I am eagerly awaiting more of Akunin's work. An entertaining read set in an interesting time in Russian history (pre-revolution). A mystery, but not a typical one, as we know the identity of the murderer from the beginning. Still, good tension as we go back and forth between the two sides. If you are challenged keeping track of characters, this book might be difficult as there are lots of players and, of course, all the names are Russian. Still, don't let that stop you. Persevere and you'll likely find you can follow things just fine. All the books in this series have been excellent. set in the years before the Russian Revolution, it's easy to see the battle between haves and have-nots. Erast Fandorin, a really great (although kind of misty in appearance as Akunin never describes him) protagonist, and the secondary characters are each very unique. Action is also unique (loved Fandorin's naked leap into the night) and surprising. Overall, a terrific series. Best read in order, no way can you read just one. State Counsellor Erast Fandorin in his role as detective is charged not only to protect but also to bring to justice revolutionaries who are assassinating key political figures in the Tsar’s regime. The lengthy novel deftly moves the reader within the historical background of Imperial Russia and all its foibles and greedy intrigues. It is an excellent translation.I was given an electronic copy in return for an honest review. Another fine Fandorin novel. One of the best, perhaps? At least it's quite the thriller, with political undertones as the nihilist plot their attacks, while the high-ranking police officials try to stop them – but there seems to be a mole in the police organisation, and fairly high, too. Fortunately Erast Fandorin is up to the task. I honestly did not like it as much as I thought I would. A crime mystery taking place during the Russian revolution? Sounds like something I would enjoy. It was confusing and hard to follow. I know who was speaking most of the time. I had to call it quits unfortunately. This book just wasn't for me. Boris Akunin Boris Akunin - Real name - Grigory Shalvovich Chkhartishvili (Russian: Борис Акунин; Georgian: გრიგოლ შალვას ძე ჩხარტიშვილი; Аlso see Grigory Chkhartishvili), born in Tbilisi, Georgia, in 1956. Since 1958 he lives in Moscow. Writer and translator from Japanease. Author of crime stories set in tsarist Russia. In 1998 he made his debut with novel Azazel (to English readers known as The Winter Queen), where he created Erast Pietrovich Fandorin. B. Akunin refers to Mikhail Alexandrovich Bakunin and Akuna, home name of Anna Akhmatova, Russian poet.In September of 2000, Akunin was named Russian Writer of the Year and won the "Antibooker" prize in 2000 for his Erast Fandorin novel Coronation, or the last of the Romanovs. Akunin also created crime-solving Orthodox nun, sister Pelagia, and literary genres.His pseudonyms are Анатолий Брусникин and Анна Борисова. In some Dutch editions he is also known as Boris Akoenin.